WASHINGTON (CNN) -- More troops, new legislation, improved troop training and added civilian expertise highlight President Obama's strategy to fight terrorism in Afghanistan and Pakistan. 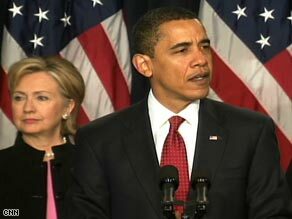 President Obama, here with Hillary Clinton on Friday, calls the situation in Afghanistan "increasingly perilous." Obama on Friday announced his plan to tackle what he called an "international security challenge of the highest order." Stressing soberly that "the safety of people around the world is at stake," Obama said the "situation is increasingly perilous" in the region in and around Afghanistan, where the United States has been fighting al Qaeda and the Taliban for more than 7½ years after attacks in New York and at the Pentagon. "The United States of America did not choose to fight a war in Afghanistan. Nearly 3,000 of our people were killed on September 11, 2001, for doing nothing more than going about their daily lives," said Obama, who has vowed to make Afghanistan the central front in the fight against terrorism. "And if the Afghan government falls to the Taliban -- or allows al Qaeda to go unchallenged -- that country will again be a base for terrorists who want to kill as many of our people as they possibly can." Obama said it is key Americans understand that Pakistan "needs our help" against al Qaeda. Flanked by Secretary of State Hillary Clinton and Defense Secretary Robert Gates, Obama called on Congress to pass a bipartisan bill co-sponsored by Sens. John Kerry, D-Massachusetts, and Richard Lugar, R-Indiana. The legislation authorizes "$1.5 billion in direct support to the Pakistani people every year over the next five years -- resources that will build schools, roads and hospitals and strengthen Pakistan's democracy," he said. He also urged Congress to pass legislation that would create opportunity zones in the border region. The goal is to develop the economy and bring hope to places plagued by violence. Obama said, "We will ask our friends and allies to do their part," including at a donors conference next month in Tokyo, Japan. "After years of mixed results, we will not provide a blank check. Pakistan must demonstrate its commitment to rooting out al Qaeda and the violent extremists within its borders. And we will insist that action be taken -- one way or another -- when we have intelligence about high-level terrorist targets. " Obama said the United States must work with the World Bank and International Monetary Fund and others to help Pakistan get through the economic crisis. "To lessen tensions between two nuclear-armed nations that too often teeter on the edge of escalation and confrontation, we must pursue constructive diplomacy with both India and Pakistan." Afghan President Harmid Karzai watched the speech on CNN from Kabul, said Richard Holbrooke, Obama's special envoy to Afghanistan and Pakistan. Karzai "is extremely grateful and will issue his statement of support," Holbrooke said. Obama stressed that "Afghanistan has been denied the resources that it demands because of the war in Iraq" and now a commitment must be made. Obama said he is sending another 4,000 troops to Afghanistan, along with hundreds of civilian specialists, such as agricultural experts, educators and engineers. The troops -- which are in addition to the 17,000 announced earlier -- will be charged with training and building the Afghan army and police force. The stakes are high as al Qaeda and the Taliban have escalated the insurgency and the number of U.S. troops deaths spiked last year -- the highest yearly death toll for them in the war. Obama said the coalition "will accelerate" efforts to "build an Afghan army of 134,000 and a police force of 82,000 so that we can meet these goals by 2011 -- and increases in Afghan forces may very well be needed as our plans to turn over security responsibility to the Afghans go forward." Obama said the United States will set clear benchmarks for international assistance and won't ignore attention to corruption. He said the United States will develop a new contact group for Afghanistan and Pakistan that would include not only NATO allies and other partners but also Central Asian states, Gulf nations and Iran, Russia, India and China. Reacting to Obama's plan, Sen. Russell Feingold, D-Wisconsin, said he is pleased the president is focusing on al Qaeda and is addressing the role of Pakistan but expressed concern the strategy could remain "overly Afghan-centric." Citing Friday's suicide attack on a mosque in the Pakistani tribal region near Afghanistan, Feingold said, "This new administration must ensure that we do what we must not only in Afghanistan but also in Pakistan." He said, "As the bombing near the Khyber Pass this morning highlights, we need to fully address the inextricable links between the crisis in Afghanistan and the instability and terrorist threats in Pakistan." The bombing killed at least 48 people and wounded 80 to 90 others. Senate Minority Leader Mitch McConnell praised Obama's plan, saying it is "a significant pivot" away from the Democratic Party's left wing. "So the president's decision to continue Secretary Gates, follow [U.S. Central Command chief] Gen. [David] Petraeus' advice -- which may be somewhat exasperating to his own political left -- I think is in the best interest of the country and I think he's going to enjoy pretty strong Republican support for the plan," the Kentucky Republican told reporters.